As I hoped for this is a wonderful spring morning. The last couple of days there's been raining. I pack some lunch, tie my hiking boots and then I'm off. I take the bus to Camp Fjällnora just outside Uppsla. After a 3 km walk I reach the trail; Upplandsleden. The sun is shining, +15ºC (+59°F) in the air and the birds are singing... This is life! I walk the curly trail in a north east direction and the first km's offers a magical green forest with big fury rocks. Then I reach the glimmering lake called Lötsjön for a nice hike along it's shore. When I reach the quaint village of Länna I get to see the railway museum Lännakatten. Up until now I've been alone on my hike but now I meet two gentlemen preparing the trail for the summer season. They tell me that there will be a new rout from this point on and it's not yet finished. I thank my new friends for the information and take out compass direction instead of following a trail. The vegetation is of course a bit more rough without a trail to follow so the time pass quickly. The sky is turning darker and a storm is coming up, therefore I head to the nearest village; Almunge to catch the bus back to Uppsala. This got to be a really great hike. The beautiful 20 km spring hike took me in total six hours. A nice little hike I truly can recommend if you have a day off. The Daxio Daypack is a very practical and comfortable backpack that's suitable for both urban and outdoor activities. The pack comes with a 0,5 litre drinking bottle fitted for usage of Camelbak’s water system houses. You can also insert a bigger water system inside the bag. Daxio is equipped with a inner computer pocket and a discountable hip belt. The Camelbak Daxio Daypack is a high quality and good looking backpack that I've now used for five years, and it's still going strong. The Hiker 75 is a roomy backpack offered by ÖoB. The price is very low and unfortunately this shows on the zippers and the buckles. The padding in the straps is ok and there's a lot of nice pockets for easy access. The Hiker 75 could be a cheap alternative if you're not planing any longer hikes or if you only will carry light. But in that case my advice to you is to bring a little repair kit in case you need fixing the backpack on the go. These are a pair of robust medium high hiking boot from Hi-Tec. They are light, comfortable and water resistant. I've used my Outdoor Altitude IV for three years in various terrain and I'm very pleased with the boots. My advise to you is not to bye a too big size of these boots as they tend to stretch when used under harsh conditions. I bought the boots during my time in the US hence the good price. Unfortunately I haven't seen any Hi-Tec dealers in Sweden yet. My little Sonia and I take a relaxing moment in Steningedalen; a nice little nature reserve close to the town of Märsta. The spring sun is reflecting powerfully in the white snow. The Märsta River runs thru the arranged wetlands of the reserve and makes a perfect home for many bird species. It's fascinating walking on this land knowing that during the bronze age all this was covered by the Lake Mälaren. It was then possible to sail all the way in to where today's central station is situated. The knowledge about how to survive in the outdoors is a mixture of Bushcraft knowledge and a understanding of how one's psychic and body work under pressure. This knowledge gives individuals the ability to be comfortable under harsh conditions, with or without equipment. Examples of such knowledge is how to; build shelter, start a fire, find water, navigate, treat physical and mental injuries. I have my own method of training bushcraft techniques and to gather experience of survival under more extreme conditions. 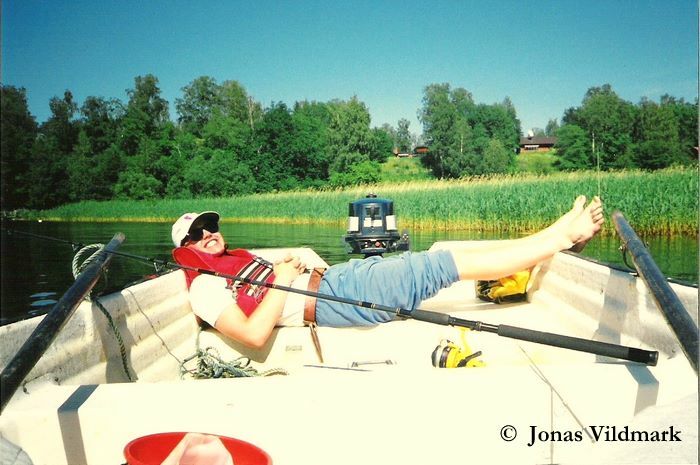 I call the method Jonas Vildmark's Method for Survival Training (JVMS). This method is meant to be used as guidance, reflection and inspiration to knowledge and experiences. This method can be described by the formula; [xobject+10xkm+10xh]. The concept is based on the ratio between equipment, distance and time. I will now describe an example. Description of a "JVMS 6"
If I choose to carry out a 60 hours (2.5 days) long survival training session I restrict my gear to only 6 objects and I plan a 60 km long hike. With this example I replace the variable x with the number 6 and get the equation:[6object+60km+60h] = "6 things and 60 km in 60 hours"
The definition of an object is that a shirt counts as one object and a pair of pants counts as another object. A pair of socks counts as one object and a pair of shoes is another. A tent tarp counts as one thing and a tent pole is another object. If I choose to bring a fixed blade knife; for safety reasons then the sheath is not counted as a separate object. But if the sheath is equipped with for instance a wet stone, then the stone counts as a separate thing. My packing list for a "JVMS 6" during the summer season could look something like this. Note that I've opted out underwear and backpack. For safety reasons, in addition to the above list, I also bring a Safety Kit holding; ID card, a fully charged cell phone, first aid bandage and a C-A-T (Combat Application Tourniquet), in case of an emergency. If you're in need of frequent medication that medicine should also be included in the Safety Kit. I also bring my camera so that I can document my experience for you, my dear reader. The above is the gear I bring to the exercise. If I find stuff like a beer can or a plastic bag in the woods I can also use them if I want. In this "JVMS 6” example I plan a suitable 60 km (at the least) route for hiking which will be covered during the 60 hour (at the least) long training session. A good tool in your route planing is a digital map (for instance Eniro or Google). For documentation and confirmation you could bring a GPS to record your rout. But then the that GPS should be kept inside the Safety Kit and not used for navigation. If used for navigation the GPS should count as one object on the packing list. It's perfectly OK to replace one of the 6 items in the gear list with for instance a bicycle, if I feel I can do without for instance the compass. But I still need to spend the entire 60 hours outdoors, despite the fact that a bike might enable faster transportation. Also note that any loose accessories on the bike, such as a bag or a bicycle pump, are defined as additional items to be accommodated within the framework of the list, as in this case only may consist of 6 things. Of course I could chose a car, with all loose objects removed, as one object. Buy then the hole idea of this method gets lost in my opinion. 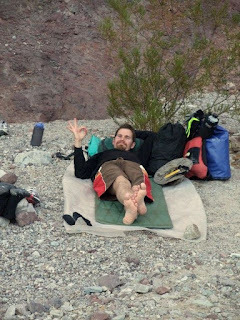 Jonas Vildmark's Method for Survival Training (JVMS) shows; the more things you bring with you into the outdoors, the more comfortable you might be able to get. But more stuff also means that you'll be needing to cover a longer distance and spend more time outside in nature's juste, but sometimes tough environment. The transportation part of the method is perhaps the most challenging, but it can be seen equivalent to a scenario where you have chosen to leave for instance a crash sight to find help. Always bear in mind that this method, or other training methods similar to this one, are activities meant to bring knowledge and experience in a creative and safe way. Your survival skills may one day save your life, therefore it's very important that you execute your training with big personal responsibility. Always listen to your common sense and be honest with yourself , your and others' limitations. If you're the least unsure, do not execute a training session like this without experienced company. Always notify friends or relatives about your plans before heading out. To get acquaintance with Mother Nature this way should be a pleasure, although a tough one. Remember that you need the landowner's consent if you're planning to make damage (break branches and take down trees) to the land you'll be staying on during your training session. Have fun out there and please let me know if you have any questions regarding Jonas Vildmark's Method for Survival Training (JVMS), or if you would like to share your experiences. Or why not hire me as you instructor during your survival training adventure. Read about the first time I tested JVMS by clicking HERE. Last night I packed my bag with some food, sunblock and gear. Today I'm up early; time for some spin fishing! Now I'm sitting in my little boat on my way out on the water that's calm like a mirror. It's a beautiful summer moring and the sun starts heating up my face as she arise. I often fish here in Mälaren just south of Uppsala and it's always a joy to relax on these waters. This morning is really calm; no activity what so ever in the water. Perhaps it's too warm in the water. The hours passes and I enjoy my casting and my sandwiches. But then at 07:00 pm it's just like turning on a swish; Boom! a 2 kg pike stikes at my Abu Garcia Atom spoon. On my next cast; Boom! a 1 kg pike. Two hours later I've hooked five lively pikes, two nice zanders, two fat perchs an a really big ide. The biggest pike was about 5 kg. What an amazing day this turned out to be. After securing my boat I turn to the water, lift my hat and thank for this generous day. 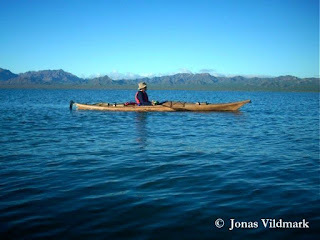 To explore our nature by canoe or kayak is truly a joy. It's possible to get really close to the wildlife when silently sliding along the shore by canoe. But of course if you need an adrenalin rush you can always seek more lively waters and falls. Today you can easily find a canoe for rent if you don't want to by one for yourself. Just check that all gear needed is included in the rental deal and remember that usually a glasfibre vessel is a bit more fragile than the more robust plastic version. It's very important that you feel comfortable and safe when paddling. Besides the obvious stuff like knowing how to swim, safety jacket, and well informed buddy's on land, I can recommend you take a basic paddling course to learn what to do when your boat turns over. And remember; always hang on to your paddle! It's your ticket back home. A bad job packing your canoe can spoil a good trip. A big advantage when paddling, compared to hiking, is that you're able to bring more stuff. Actually the watercraft often behave better in the water when it's loaded. This is of course pending on how good you pack your vessle. Its a good idea to pack your gear down by the water to avoid carrying a heavy boat down to the water. The fact that the canoe (Canadian style) is an open boat puts a higher demand on securing your gear. The idea is that when you turn over and back again none of your gear should be lost floating around in the water. Some like using big plastic barrels with tightly sealed lids placed on the bottom of the canoe. Personally I prefer using dry bags in different sizes and strapping these tightly inside the canoe. Try placing the most weight low and in the centre of the canoe. 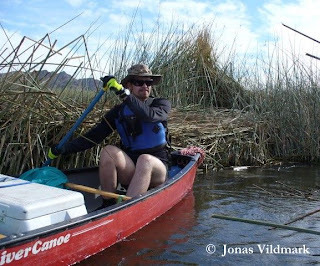 Use synthetic tie down straps to secure the containers inside the canoe. If you use a non-synthetic material there's a risk of the straps stretching when wet. It's important to use strapping points close to the containers to prevent the "Triangle of Death"; the risk of getting a foot or an arm stuck in the straps when tumbling over in the water. More frequently used gear you can place in a smaller dry bag at your seat. There's also some smart bottle holders on the market that you can use storing your drinking water close by. Also don't forget securing your back-up paddle. A covered boat often comes with nice storage compartments with water resistant lids. Try pacing the most load as low and centered as possible. Your water stash is preferably stored in a bag behind your seat. Put your water bottle and laminated map under the loading net in front of you. Also see to that your safety gear, including an back-up paddle, is easy accessible when you need it to get back up into the kayak. I use fast drying fabrics like for instance polyester. Swimming and sports wear works fine. When in colder waters you can use your diving/surfing suites or fabrics like wool, try avoiding cotton. Training shoes or diving booties for your feet, diving gloves for your hands and sun screen, a hat and a pair of Polaroid sunglasses (with safety strap) is good pals when paddling. HERE you can find more tips on clothing. I hope these advise helps you out in the future. Have fun! I try to use roomy clothing that helps my body to breath as much as possible. I avoid cotton, the saying "cotton kills" comes from the fact that cotton very efficiently absorb fluids as rain and sweat, and when wet you get cold. Instead I use woolen or synthetic materials. Instead of one thick layer I use several layers of clothing allowing me to adjust to temperature, weather and activity; the colder the more layers. I always bring an extra set of socks and long johns inside a dry bag. This way I can keep warm while the wet set dryes off. Below I've listed what I usually use for clothing at a non-diving activity. When hiking I use comfortable, supporting and water resistant leather boots. Closest to the foot I wear a liner, a thin sock, and then thicker socks. When out paddling I instead use a pair of diving booties. 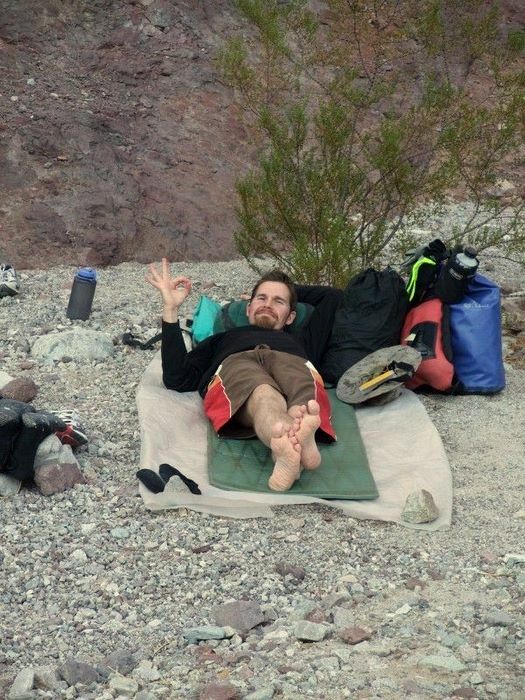 On longer trips I usually also bring a pair of sandals or training shoes for resting my feet in camp. I like roomy long legged trousers protecting me from wind, sun and vegetation. Instead of boxers I use a pair of swimming shorts. These are comfortable, dryes quickly and are practical when you like to take off your trousers. Even when operating in non-arctic environments I always bring my long johns for snuggling in camp. Closest to my skin I wear a thin long sleeve polyester shirt. On top of that a warmer fleece jacket. And then a wind and rain resistant jacket with a hood and allot of practical pockets. I also bring a big and warm winter coat to put on while resting. Pending on the climate I use a boonie hat for protecting me from the sun, a baseball cap or a beanie. When i tough and cold weather a hood on your jacket is a blessing. Often I bring a scarf. The scarf and beanie is also nice wearing while sleeping outdoors. Usually I bring three type of hand wear. A pair of work gloves, a pair of knitted gloves and a pair of warm mittens. When paddling I use a pair of thin diving gloves. As you've notest I don't prefer bringing rain coats and such, they just make me wet from the inside of sweat. Instead I use easy-drying materials, a robust jacket and a set of change. I hope this post gave you some good ideas on what to bring on Your next adventure. There's a lot of fun gadgets you can bring along on your trips. Problem is that this might turn an inspiering hike into a logistic nightmare. To get the moust out of my trips I plan my adventures by putting together a packing list containing the stuff I think I'll need bringing. Then I try to scratch as much as possible off that list cous there's always some stuff that is not needed. Truout the years my lists has gotten shorter and shorter as trips goes by. It's also fun to challenge yourself to se how short the list can get without spoiling the experiance of the trip. When out hiking I often use a backpack. For one day only trips I use a 30 litre size backpack (Daypack). For trips lasting over the weekend I use a 70 litre backpack (Weekendpack). On the trips longer than that I usually use a 100 litre backpack (Weekpack). If I know I'll be moving in humid areas I start off my packing by applying a big plastic garbage bag inside the sack. This helps keeping my stuff dry and the bag also can turn your backpack into a good floating device when advancing in water. Change of clothes, matches, paper and food I put in a separate drybag inside the backpack. My advice is also to always store your drinking water and other fluids outside the areas of the backpack you want to keep dry. Sooner or later the fluids will leek and then you don't want it to get inside the plastic bag or the drybag. If you ever have tryed drying a sleeping bag you know what I mean. HERE you'll find more tips on clothing. When kayaking or canoeing you often have the possibility to bring more stuff along inside the boat. I then like using different drybags inside the compartments to be sure to keep stuff dry. Another good thing with the bags is their ability to adept to the shape of the compartment. This gives an efficient storage. The bags are also easy to fixate by using straps. HERE you'll find more tips on packing your canoe. Always remember placing the stuff you need most frequent on top for easy access. Also always have a garbage bag at hand to collect the trash you and your buddy's produce. Have a nice trip. Me and my friends have almost a hole week of inspiring adventures in front of us. We take the road down to Bahia Kino and in Punta Chueca we meet up with the Seris who will help us out with the van and trailer during our week. We spend a rainy and stormy night on the shores of Sea of Cortez before crossing over to Isla Tiburon. The island is generous to us; strengthening running, snorkeling, hiking and just lying in the sun. To go to sleep under a sky full of stars is always magical. We also got to meet the amazing wildlife; dolphins, stingrays, pelicans, scorpions, and coyotes. I'm truly grateful for this beautiful experience. Me and my friends take the six hour drive north-west of Tucson to the border of Nevada. 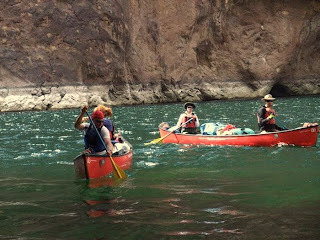 There we put our canoes in the Colorado River to paddle upstream through Black Canyon. 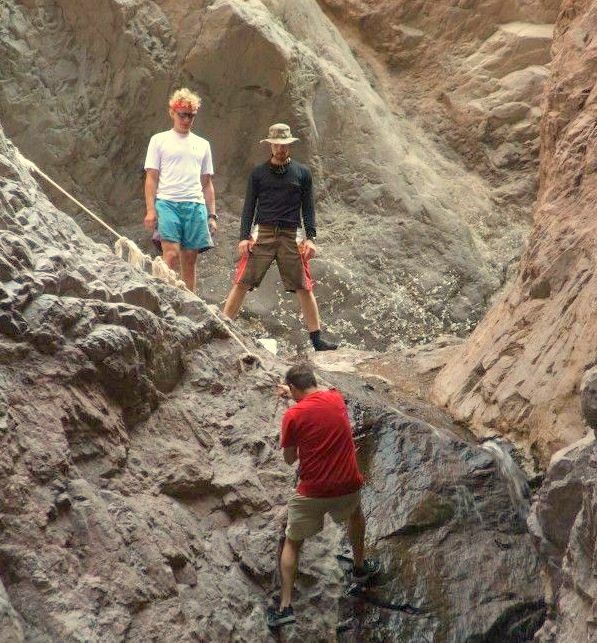 This canyon is the extension of Grand Canyon with the Hoover Dam as a divider. During the weekends they limit the flow through the dam and this makes this upstream paddle possible. after a good day's workout we make camp half way up to the Hoover Dam. We keep this camp a couple of days and go on with the canoes to take a close look at the dam. Seen from a little canoe its indeed a majestic sight looking up at the Hoover Dam. Also interesting checking out the construction site of the bridge that will stretch along the dam when its finished. Now and then we make stops on the river bed to make short expeditions up the mountains climbing this beautiful surroundings. A relaxing feature of the canyon is the hot springs hidden in the mountains, giving us nice and warm baths. We also found a dark cave, hot as a sauna, really exiting to explore. This warmth was well welcomed as the river water is pretty cold. The last trip day we break camp and head downstream back to our van. This trip offers amazing landscape with a rich fauna. We got to see allot of mountain goats, fish and birds. I'm truly grateful for this beautiful experience. Life is good; I have a calm evening of blind hunting in front of me. I'm walking out to tower number 81 at 04:45 pm. The snow crunches under my feet and the crispy -10°C (+14°F) is biting my happy nose. This is a beautiful evening but the animals is hiding good from me this night. But I get a nice evening reflecting over a good hunting season. I'm grateful for the knowledge I've won during the past year and my heart is full of respect for the beautiful animals I've got to meet. The annual Driving hunt (Klappjakt in Swedish) in Bogesund is always a nice arrangement. For many of us this is a good way to end the hunting season. Today's lovely spring sun gives us a beautiful and refreshing day in the woods; -6°C (+21°F) and a blue sky. It doesn't take long before a fox is laid down and this is of course the main topic around the lunch fire. The hunting form Klappjakt is often a very social hunt as the arrangement need a lot of participants. By the end of the day we have seen four foxes in total and a lot of roe deer. There was also a lot of wild boar traces on the land. Thank you for a beautiful day. This year's Wilderness Fair (Vildmarksmässan) is special to me; for the first time I'm bringing my one year old daughter Sonia to the fair. During these four exhibition days outdoory stuff is shown in one of the fairs three big showrooms. The other two is displaying The Boat Fair. The two best things about the Vildmarksmässan I think is the inspiring presentations that is given throughout these days on the Wilderness Fair's three stages, and also getting to meet all my outdoory friends attending the exhibition. For you guys visiting the fair I hope you got inspired to start planing your next adventure. Sonia loved the fair. Malmö is Sweden's third largest city situated in the country's southern part. The central part of Malmö have three big city parks. Today me and Sonia visit two of these as a relaxing hike. In the year of 1900 the 21 hectare park of Slottsparken (The Castle Park) was finished and became Malmö's first official city park. The park designer was Edvard Glæsel who was inspired by Central Park in New York. Nearby the Slottsparken you can find Västra hamnen (The Western Harbour) that offers a magnificent view of Öresund. Erik Erstad-Jørgensen and Erik Bülow-Hübe helped shape Pildammsparken (The Willow Pond Park) during the years 1914-1926. Pildammsparken is Malmö's largest park by its 45 hectare. I think it's important to cherish these beautiful small oasis in our cities. We truly need them for nice walks like this to calm our modern busy souls. This was a good, beautiful and refreshing walk for me and my little Sonia. The snow has just rained away here in Malmö but the cold air is still sticking around. The freezing winds from Öresund bites my cheeks and fills my lungs with fresh oxygen. My little Sonia, sitting on my back, is snuggled up behind my neck sleeping, as we slowly hike along the coastline of Bunkeflostrand. This beautiful area is Malmö's oldest national park and is a important home to many bird species. The shallow waters also make a good place for fish to thrive. For centuries the nutrient soil here have made this a good pasture for livestock. It's a majestic sight to see the Öresund bridge over to Denmark spreading all over the bay connecting to the Bunkeflostrand; a nice meeting between the old ways and modern engineering. Time to upgrade my skills in scuba diving. I'm here this weekend in Kapellskär together with my friends at Dyksport AB to get my Advanced Open Water Diver certificate (AOWD). We are a nice group of diving enthusiasts who gets to enjoy dives containing activities like navigation, search, salvage and deep diving. It's +10°C (+50°F) both in the air and in the water. I'm fortunate to get to see eelpout, perch, turbot, plaice and pipefish. I have a great and thankful smile all over my face all the way home. The Chocolate Mountains is rises besides the Colorado River in Cibola National Wildlife Refuge. The river outlines the natural boarder between Arizona, California and Nevada. 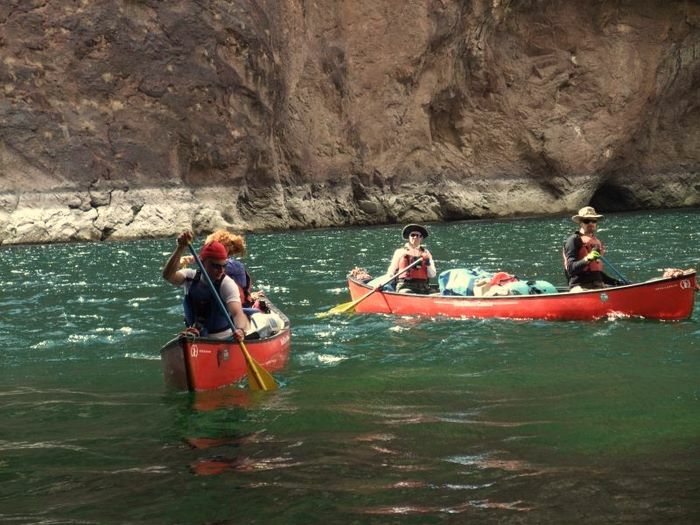 Me and my friends are canoeing in the south parts of the Yuma area. We are going down streams along the Colorado River with the Arizonian desert on one shore and the green California on the other. It's a funny feeling when traveling along the more narrow parts of the river, to have also the time difference of one hour pending on what shore I'm standing on. This is a very peaceful and beautiful 57 km long stretch to paddle. The sun is just right, warming my happy body and when ever I feel like it I can take a refreshing dip in the calm river. I get to see a lot of fish and I understand why this area is a refuge to over 200 different bird species. Luckily I get to see; canada goose, blue heron and white pelican. This is probably the most relaxing trip I've ever done here in the States. Thankful to be able to spend this fantastic time with my friends.